Can honesty be the worst policy? Bernadette Terrell has always known the right thing to do. Not the most popular girl in school, her focus has always been on academic, not social, success. When her favorite teacher names her to Wickham High School's state championship quiz bowl team, she believes that she has reached the pinnacle of her high school academic career. However, her elation quickly fades as she begins to suspect that perhaps someone cheated to get Wickham into the contest and is cheating still. In her search for answers, Bernadette must contend with a situation that isn't black and white, where a community's hope, hard work, and pride are on the line. Is a team -- and a school -- implicated by one person's behavior? Cappo's blend of suspense and humor makes Cheating Lessons a riveting story about right and wrong -- and the downside of trust. 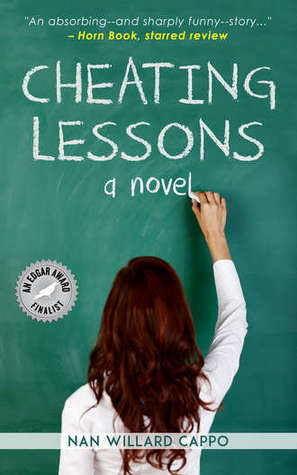 My first novel was CHEATING LESSONS, in which a teenaged girl must finesse a cheating scandal in her school. It won an Edgar nomination for Best YA mystery. My latest book is UNACCOUNTED FOR, a bit edgier--suitable for mature teens and adults (has a male hero this time). I'd love reader feedback on it, as I'm writing the sequel now. I loved the mystery...just not the characters. I just couldn't connect with any of them especially the Bernadette. She was such a flat character and I feel like she thought she was waaay above everyone else. And don't get me started on that rushed romance, if you can even call it that. The story was so slow. I had to put it down so many times. Again, the only redeeming qualities is the mystery and the humor. I read juicy romances when I'm sad.